CLICK HERE FOR GRIP SUPPORT! 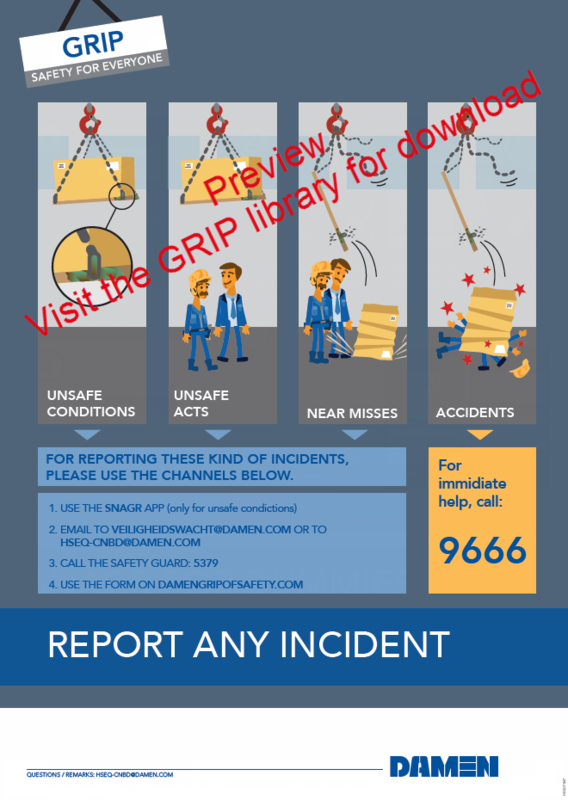 The Governance of Risks and Incident Prevention (GRIP) program is pivotal to our strides towards continuous improvement, as it sets the Damen health, safety and environmental standards for our organizational processes. It is through this initiative that we take preventative steps towards safer operations and share our vital lessons, to further propel safety excellence. 'This website is open to all and facilitates more content than ever before! You can now explore our latest safety publications including: standards, guiding principles, animations, posters, safety alerts and indulge in some new “ Hot Topics” for important office safety tips. 'Also available now is the GRIP Library! 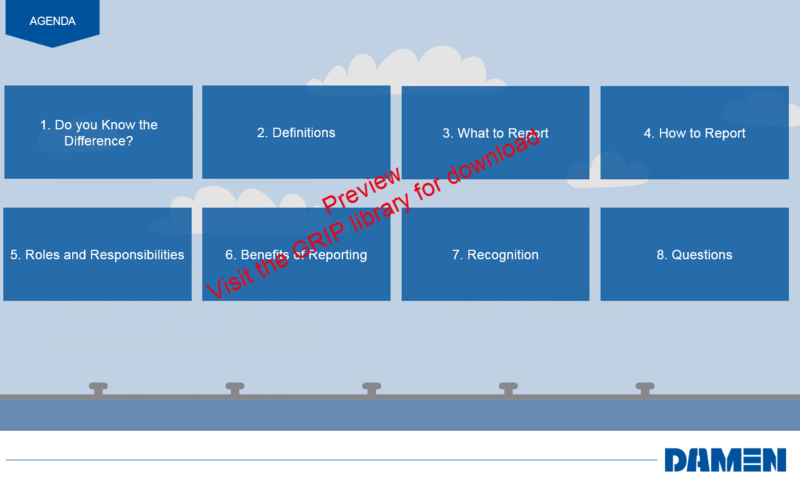 The library offers a multi-language database of safety information, right at your finger tips. Are you an employee of a Damen Group Company and wish to visit the GRIP library? Contact us today for secured access. Hereunder are the latest published safety documents. Visit the website frequently to stay up to date with “what’s new”. This standard highlights the crucial elements involved in the incident notification, investigation and reporting process and stipulates the way in which this process must be carried out. Each Damen yard is required to have a, site-specific, emergency preparedness and response plan in place.This standard sets the bar for the development of an emergency preparedness and response plan and highlights the crucial elements needed to ensure readiness, in cases of emergency. 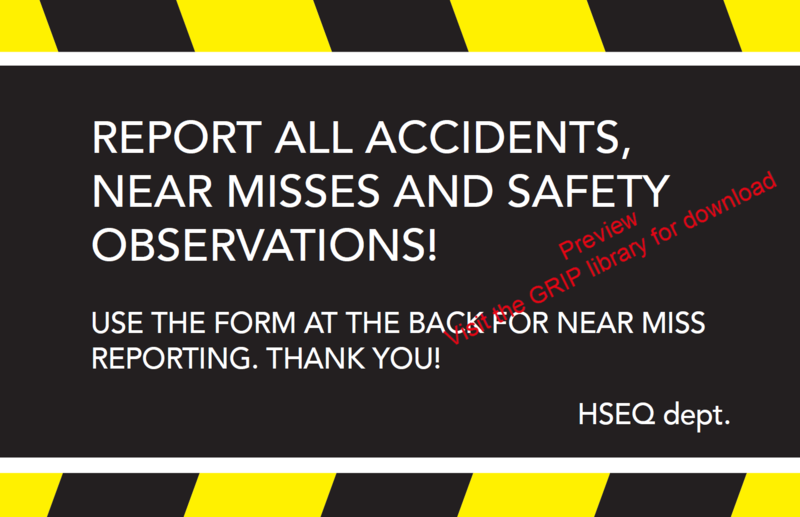 This safety briefing highlights the differences between safety observations, near misses and accidents and can be used as a guideline (toolbox) for informing the workforce about the importance of reporting all incidents. This safety briefing outlines the correct use of various types of PPE, reasons PPE should be worn and the risks of not wearing them. This safety briefing highlights the importance of protecting the feet from several hazards present in the work place. 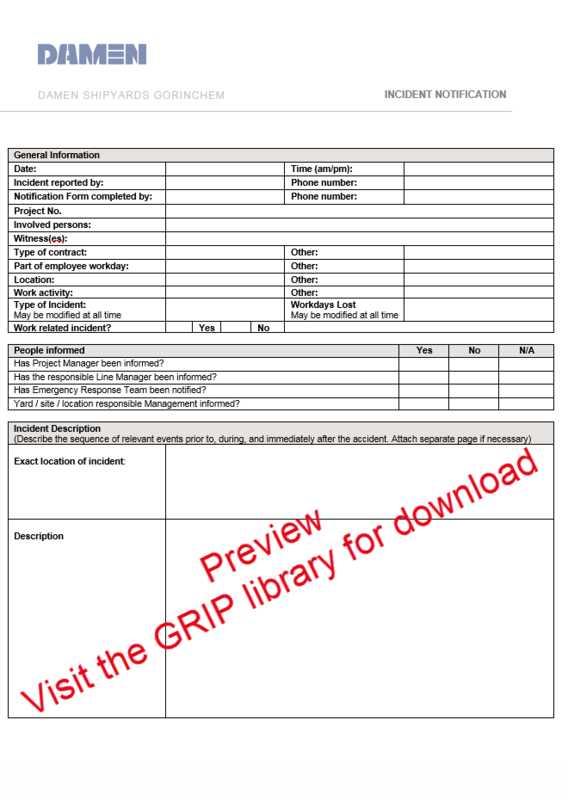 This template should be used for incident registration if there is limited access to computers at the first aid point. Each incident must be later registered in SnagR, using the incident registration form. 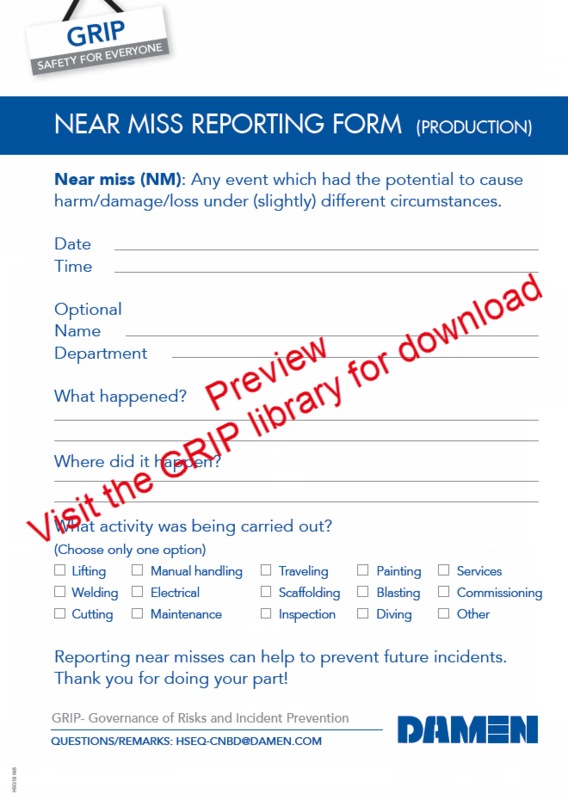 This brief near miss reporting template can be used to simplify near miss reporting in production environments. 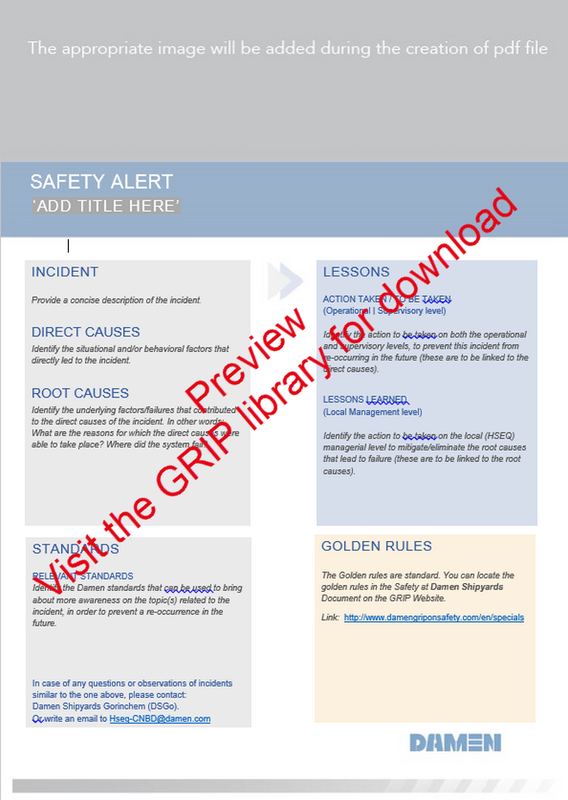 This safety alert template is to be used for incidents. 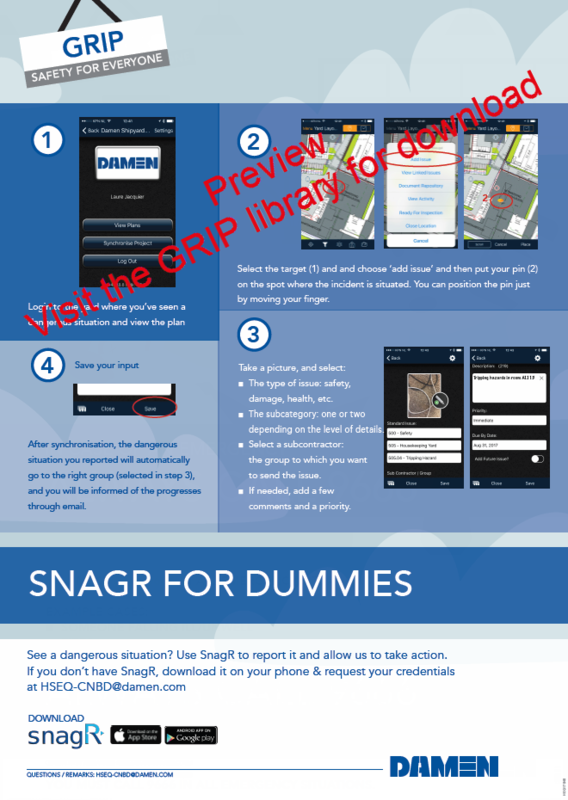 This poster provides simple steps to report safety observations in SnagR. This poster outlines the different channels available to report all incidents. Please contact us to adapt the reporting channels to your own yard.